Like the previous portraits of The Queen, which had been drawn for the banknotes issued by the Bank of England, this likeness of Her Majesty is not based on an existing portrait. 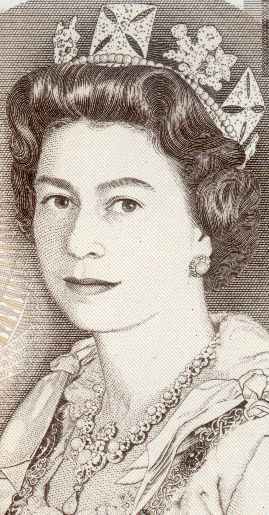 The master drawing of The Queen was executed by Harry Eccleston, the designer of the Bank's 'D' series. Three versions of the portrait were created. As well as the two version of the portrait described below, an earlier portrait of Her Majesty was prepared by Eccleston for use on the 50-pence and 10-shilling notes, which were never issued. The unused portrait was similar to Portrait 14b, except that in the unused portrait The Queen wore a cap, which is part of the full regalia of the Order of the Garter, rather than the Diadem. 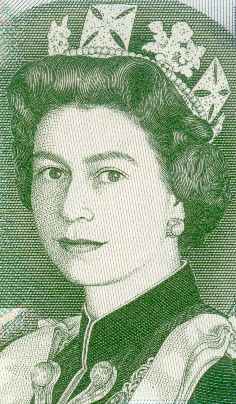 This version of the portrait was used on the 10-, 20- and 50-pound notes of the ‘D’ series. The Queen is depicted in state robes, wearing the George IV State Diadem, Queen Victoria’s Golden Jubilee necklace and Queen Alexandra’s Cluster Earrings. The necklace was bought from funds donated by the ‘Women of the British Empire’ to celebrate Queen Victoria’s fifty years on the throne. The necklace was presented to Queen Victoria on 24 June 1887. The earrings, created by the jeweller Garrard, were a wedding gift from the future King Edward VII to his bride, Alexandra of Denmark. In this version of the portrait The Queen is depicted wearing the robes of the Order of the Garter, the George IV State Diadem and Queen Alexandra's Cluster Earrings. This portrait appears on the 1- and 5-pound notes of the Bank of England's 'D' series. Bank of England -- Nos. 377 and 378.